SKY MAP: The scene just after sunset from midnorthern latitudes on Oct. 31, 2008. Venus and the moon will deliver a Halloween treat visible this evening just as little ghosts and goblins head out to gather candy. Or, if your skies are cloudy, it'll just be an invisible cosmic trick. If skies are clear, look to the west just as the sun sets. You'll see Venus, the brightest "star" in the sky, hovering just above the slender crescent moon. Far to the left (south) and higher in the sky is Jupiter, nearly as bright as Venus. Trace a line from Jupiter to Venus and you'll see it points directly to where the sun set. That line is the ecliptic, the path the sun takes through our sky as a result of the Earth orbiting the sun. The moon and planets travel pretty much in this same plane, so they too appear to travel near the ecliptic. 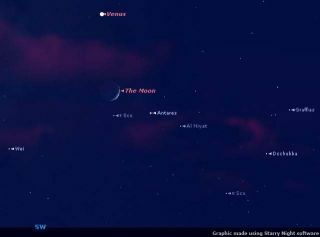 As darkness grows, the bright star Antares should be visible just to the right of the moon. You can now call yourself a fair navigator of the night sky. All three objects are so bright that they're visible even from brightly lit cities, where in some cases the night sky's star count has dwindled to just a dozen or so compared to the roughly 2,500 that can be seen in perfect conditions under rural skies. However, tall buildings may block the view of the horizon that you'll need to see this celestial conjunction, as astronomers call it. On Monday evening, Nov. 3, the moon will snuggle up with Jupiter. And looking way ahead, on Dec. 1, the moon, Venus and Jupiter will all gather for a rare convergence that will be so tight, according to NASA, you'll be able to blot all three objects out with your thumb held at arm's length. The moon is lit by reflected sunlight, and normally the unlit portion just looks dark or invisible. But the dark portion can sometimes appear dimly lit when sunlight reflects off Earth and hits the Moon, then is reflected back to Earth. The effect is strongest when the Moon is a thin crescent near the horizon.